A computerized pillow reduces snoring according to German scientist Daryoush Bazargani. "The pillow is attached to a computer, which is the size of a book, rests on a bedside table, and analyzes snoring noises," said Bazargani. Snoring is a problem that most people are familiar with; the National Sleep Foundation estimates that as many as one in three Americans snores at least occasionally. 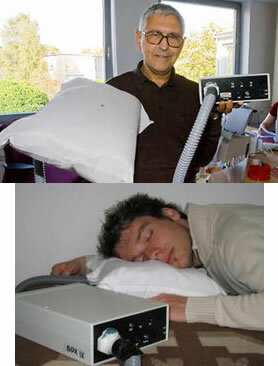 Dr. Bazargani is a snorer himself; several manufacturers are interested in bringing this prototype to the marketplace. His pillow encourages you to change your sleep position so your throat is not constricted (one of the reasons why we snore). The spherical shape of the Pod’s upper body provides you with a semi-private acoustical and visual environment. The weary are invited to a Vitality Diagnostic Corner, where a sleep counselor leads the visitor through a software program designed to create a sleep profile. Via Gizmodo; see also Snoring Haunts Millions of Americans for more information on snoring.